“How hard could it be?” I said. Climbing a Colorado 14er is certainly no joke. I’ve hiked trails as steep but not at 12 – 14,000 feet above sea level. I, and avid hiker for years, was the one that had the biggest problem with the hike. Hubby is NOT an avid hiker but he seemed totally fine. I think Gretel would have run to the top if we had let her. I ended up getting altitude sickness. What about Chester? 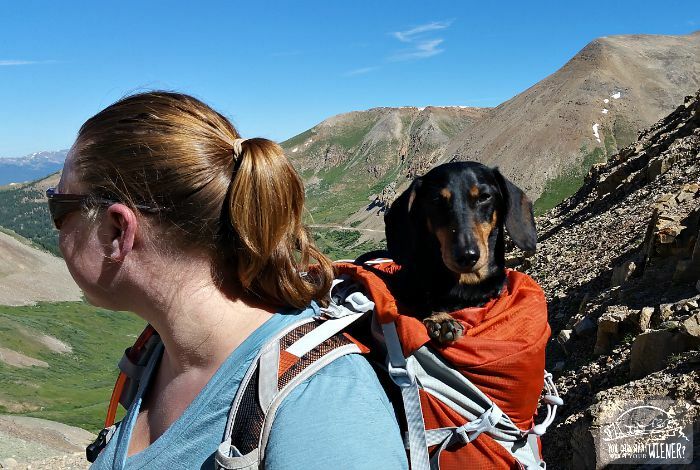 I carried him on my back (which may have contributed to my altitude sickness). This was the first time that we’ve had to carry him on a hike from start to finish. It makes me sad that my original hiking buddy might be at the end of his hiking career. The truth is, his joints are getting creaky and, I imagine, achy. He can still do the easier hikes but has slowed down a lot. I want to keep him going under his own power as long as possible so I have been on the lookout for the highest-quality joint supplement for him. In August we’ll be taking the GlycoFlex® Plus Challenge. In a Washington State University double-blind study – the effects of GlycoFlex® 3 on stable stifle osteoarthritis model in dogs – GlycoFlex® Canine hip and joint supplement was clinically proven to increase hind leg strength by up to 41%, supporting that GlycoFlex 3 may reduce the severity of cartilage breakdown. I am hoping it gives Chester a little bit of his climbing legs back. FSC: FoodScience Corporation, the company that makes GlyccoFlex, was started by a husband and wife in the 70’s and recently celebrated its 40th anniversary. The wife had health challenges and was not having luck with western medicine so they explored alternatives in other countries. They discovered a “Vitamin B15” that showed promise of helping her. They bought the rights to the research and brought it back to the US. It turned out that it wasn’t a vitamin. It was an amino acid derivative – DMG – present in all animals. The company was founded on the idea of DMG and it holds the patents on DMG for several conditions. Me: Why is DMG important? FSC: DMG helps the body produce a large amount of antioxidants, including Glutathione – pronounced “gloota-thigh-own” and referred to as “the mother of all antioxidants” by some. Me: Where does DMG come from? FSC: FSC sources their DMG from perna, more commonly called green-lipped muscle, from Australia. FSC uses the entire organism by grinding the whole muscle and turning it into powder that can be added to supplements. Since it is whole, that perna contains 57 nutrients, a full spectrum of amino acids, and other “good things”. Using the whole muscle means the nutrients are perfectly balanced because nature made them. Me: How did the FoodScience Corporation get into supplements for pets? FSC: FSC started with human supplements. The owners of the company had a deep love for and involvement with animals. They saw joint supplements for horses but not for dogs so they wanted to make something to help them. They became the first company to market a dog-specific joint supplement. They have expanded to offer other science-based supplements since then. Me: What is in GlycoFlex Plus and who is it for? 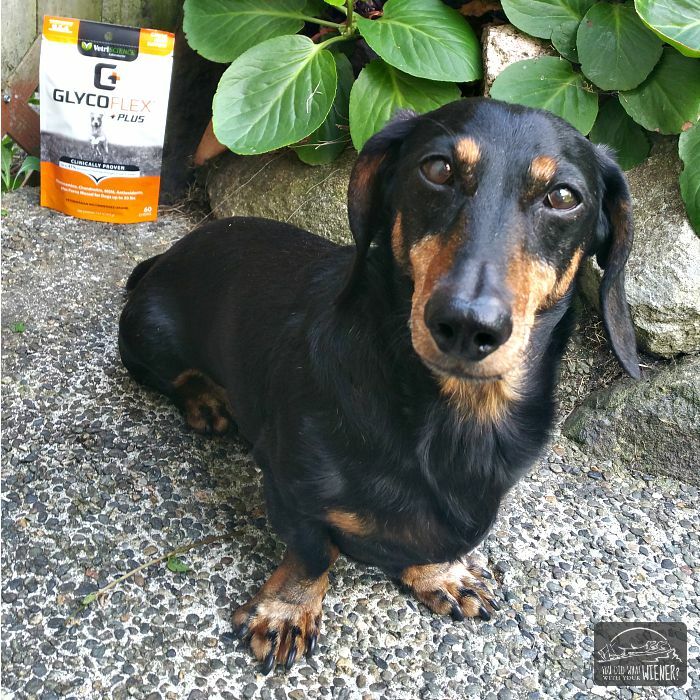 FSC: GlycoFlex Plus is very comprehensive and contains high levels of DMG-containing perna, glucosamine, MSM, chondroitin, and antioxidants such as vitamin E, C, and grapeseed extract. It is for dogs that are definitely showing signs of slowing down and having a harder time getting around (i.e. helps “crotchety” senior dogs). GlycoFlex Plus sounds promising to me so I can’t wait to try it with Chester. I don’t have details of the challenge except that participants in the challenge will be given a 30-day supply of GlycoFlex Plus to try in exchange for their feedback. My hope is that you will join us so I will let you know as soon as I have more details . I’ve heard of Glycoflex and I’m excited to follow your experience. I hope you all are having a nice time. Looking forward to seeing more updates about your trip. We are having a nice trip. The altitude is giving us a little trouble though. When I talked to the brand manager at FoodScience Corp she said that she takes DMG to help her exercise. I am curious if it might have help us adjust to 10,000 feet a little easier. I am excited to see how the challenge goes for us too. I’ve heard good things about Glycoflex from a couple of other people. My 5 year old Doxie has just developed some issues with his rear left leg. With a few vet visits they weren’t able to pinpoint the issue, but suspect it maybe a soft tissue injury. I suspect joint or early arthritis issues. I would love to know what GlycoFlex does for Chester. Stay tuned because we will be documenting our experience here and on our social media channels. I think we won’t be able to enroll in the challenge until at least the second week in August so be looking for the announcement around that time. The altitude messed with me on my only ski trip years ago! I love the mountains, but have to be careful. I’m anxious to hear more about the trip and about the results of GlycoFlex! On the bright side, he is small enough to carry. Mom is very sad Katie can’t walk much these days as she was an avid walker and an excellent runner too. She still walks 30-60 mins a day, but very slowly and not much of a distance. We can’t carry her, so she doesn’t get to join us on our fun long walks anymore. Her arthritis and all are doing pretty well these days with the supplement we have her on and her chiropractic treatments, but she is 13 and an 80 lb dog, so it is tough. We look forward to hearing how the GlycoFlex works out. It is so sad watching our buddies slow down. Sampson has been struggling a bit, so I’m very interested in hearing how this challenge works for you. I did order this and started Lulu on them a few days ago. Will be interesting to see if I notice any improvement, but more importantly, I want to keep her healthy. The bag is fairly large. You start off with one daily (depending on the weight of the pup), do that 4-6 weeks then go to every other day. Hope it works for Lulu. We have a gag of the GlycoFlex II but I haven’t been giving it to Chester yet. We’re waiting for the new GlycoFlex Plus to come out and to start the 30-day challenge (don’t want to bias our experience by using the III first). The word is that the challenge will launch on 8/28.